The estimated amount of Zakat for this year is 5 pounds. This amount would normally cover a meal for one person. In Syria, 2.7 million students are not receiving any sort of education. Mosaic Initiative has been running 3 schools for 3 years, in different parts of the war zones in Syria. Last year, we helped 635 students to go back to school. We aim this year to take in more students to reach a target number of 650 students. 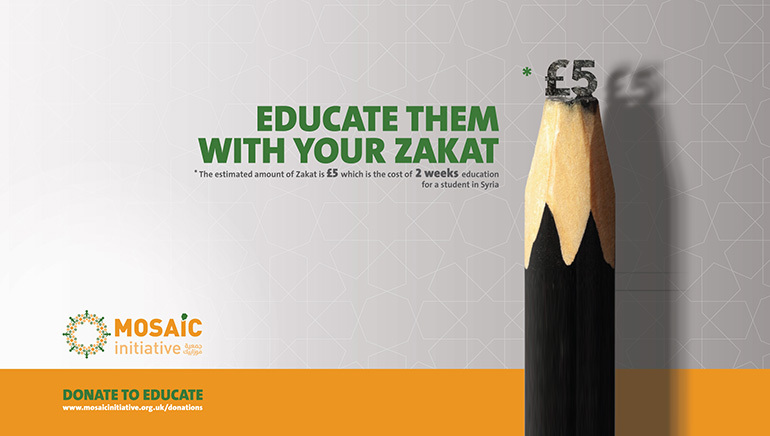 Your Zakat can sponsor a student’s education for 2 weeks. All together, we can change their lives. How Your Money Will Help?